It’s 9 a.m. on a recent Friday morning, and Mike Matot and his two-man crew on the Fort Ticonderoga ferry have already downed nearly a dozen cups of coffee and are working their way through a sinful-looking bag of maple-glazed donuts. An hour later, the guys snack on homemade cookies and some Halloween candy, gifts of gracious ferry clientele. While their doctors might cringe at the men’s morning diet, no one could deny they’ve earned it. In a regular year, the ferry service between Shoreham, Vt., and Ticonderoga, N.Y., would have ended by now. But this is not a regular year. Right now, the Fort Ti’s transportation services are critical, and the crew is keeping the ferry afloat. The boat is the only immediate fix to the crisis caused by the closing of the Crown Point Bridge. What is normally a quaint tourist ferry has now become the sole means for working people in this part of Vermont and New York to cross Lake Champlain. 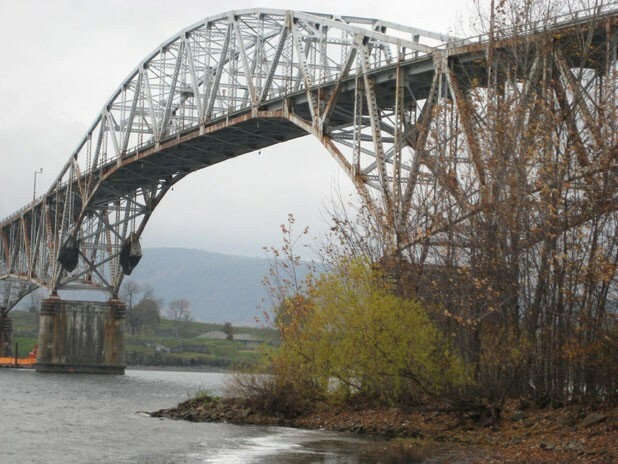 On October 16, the New York State Department of Transportation and the Vermont Agency of Transportation made a joint decision to close the bridge that spans the lake between Crown Point, N.Y., and Chimney Point, Vt. Citing catastrophic pier failure, they deemed the bridge unsafe for travel and immediately shut it down, even for foot traffic. The bridge once accommodated about 3500 cars per day. While both states share ownership of the bridge, maintaining the span is ultimately New York’s responsibility. It is Vermont’s obligation to keep up the bridge at Rouses Point, the other car crossing jointly owned by the two states. To say that residents on both sides of the lake were taken by surprise would be a gross understatement. Many use the bridge to travel to and from work every day, and most had little, if any, knowledge the structure was unsound. Regular Crown Point commuters scrambled to find transportation alternatives. For many, that meant facing the prospect of an exhausting 100-mile detour that takes them around the south end of the lake. Matot and his cable ferry spared many people the long detour. By remaining open and extending his hours, the 41-year-old Whiting, Vt., man has become a hero to untold numbers of locals who, in the past two weeks, have come to rely on him and a 16-ton tugboat named Addie B. The Fort Ti ferry is a sweet old gal, with the emphasis on old. A ferry service has operated in some capacity at this crossing since 1759, making it one of the oldest ferry operations in business today. In the early days, a double-ended sailing scow shuttled folks across the water. Today, travelers cross the half-mile on a cable-guided steel barge pushed by Addie B. The ferry matches its bucolic, picture-postcard surroundings. Around the barge are folksy, hand-lettered signs warning passengers to watch their children. A box full of maple syrup is for sale on the starboard side of the deck. Matot is a dyed-in-the-wool apple farmer who runs an orchard in Shoreham. His shaggy brown hair is topped with a bright red cap advertising the ferry he operates. He spits tobacco into a plastic bottle while he waits inside the cabin during the crossing. Outside on the deck, he jaws with drivers as they sit in their vehicles. Dogs making the brief journey can count on Matot for a biscuit. When the bridge closed, Matot’s whole life changed. He now wakes well before 4 a.m. to get ready to transport people by 5. He’s lucky if he makes it home before 8 p.m. on weeknights. He rarely sees his 8-year-old daughter. At night, he tosses and turns. His wife, Alison, a schoolteacher in Addison, told him she recently caught him directing traffic in his sleep. The upside of all of this? He and Alison never fight because they never see each other, Matot says wryly. When the two states’ transportation authorities closed the bridge — a more vital corridor than anyone imagined — they approached Matot and asked him to extend both his hours of operation and the ferry’s seasonal run. Normally by November 1, the ferry would have been dry-docked at Larrabee’s Point, waiting for the following May. That’s not all that’s changed. A one-way trip on the Fort Ti ferry used to cost $8. Now all Lake Champlain ferry crossings are free — a measure taken to mitigate the financial impact of the bridge closing on commuters. Vermont and New York agreed to subsidize the ferries, and Matot and the lake’s other ferry operator, Lake Champlain Transportation Company, are providing their services at a discount, says John Zicconi, director of planning, outreach and community affairs at the Vermont Agency of Transportation. The transportation authorities reasoned that, since the ferry companies would see a spike in ridership under these conditions, they wouldn’t mind accepting a reduced fare. Matot will receive $7 for every passenger he ferries across the lake. The crew emphasizes that the stress commuters are experiencing doesn’t keep them from being appreciative. Everyone affected by the bridge’s untimely closing seems to have become more neighborly. Matot can’t say enough about how good people have been to him during these past few weeks. At around 4 a.m., lines of cars start forming on the New York side of the ferry route. They’re filled with rural folks who find jobs where they can get them, even when that means traveling to the neighboring state. Many work in Middlebury or Vergennes — a commute of no more than an hour each way when the bridge is open. Since it’s not, their best option is to wait in line for the Fort Ti to pick them up and shepherd them across the depths. But at least these people waiting patiently for Jon Porter, the captain of the Addie B., can be thankful they still have their jobs. Some tell stories of Crown Point Bridge users who lost their employment either because they couldn’t make it to work on time, or their employers were forced to scale back. Matot says he’s heard so many tales of sorrow caused by the bridge closing, he just has to shake his head. The trickle-down effect has been intense. Linda Devino is one of those people who lost her job. During the eight-minute ferry crossing, Devino’s husband, Ed, explains that she worked at West Addison General Store on Route 17, but when business ground to a halt, the owners had to let her go. There is no longer any traffic on Route 17, which leads right to the bridge, and the area feels deserted. “Walking down 17, it’s like a ghost town,” Devino says. Lorraine Franklin owns that general store where Devino’s wife used to work. She has watched her business plummet by 70 percent. The general store relied primarily on bridge traffic — people who would stop in for gas or a drink on their way to or from work. Now, Franklin says, locals just come in to help her out. They feel bad for her. Despite the burden of shuttling 700 cars across the lake daily — up from about 100 before the closing — Matot and his crew maintain their sense of humor. Inside the tug’s cabin, Matot, deckhand Terry Norris and 71-year-old Porter, who has been the ferry’s captain for 43 years, poke fun at each other and marvel at how screwy this bridge situation appears to be. Matot grabs a short brown wig and eggs on Porter, whom the guys call Pops, to put it on. Apparently, one of the ferry regulars bought the wig for the balding captain at a yard sale. Porter, a slight fellow with a white chin-strap beard, relents and plops the wig on his head. The men have a laugh at Porter’s expense before they exit the cabin and help the vehicles disembark. Later on Friday, Bob Dedrick, the Ticonderoga town supervisor, visits Matot. He’s come to see how the ferry and her crew are holding up. Dedrick’s perspective on the situation is unique. Every day, he says, residents call to tell him they got laid off, or their business is dying, or they can’t afford the extra childcare they need with the longer commute. He’s heard from a few people who left their homes and rented apartments on the Vermont side so they wouldn’t lose their jobs. Others are having trouble making their dialysis or cancer treatments because they can’t get to the other side of the lake. A handful of people have taken matters into their own hands by crossing in kayaks or canoes. Not surprisingly, transportation authorities advise against this. Currently, the two states are investigating the prospect of a ferry service that would cross at nearly the same point as the bridge. This will take time, Zicconi says, since it will require the building of new docks and roadways linking traffic to the current routes. In the longer term, the states are looking at building a temporary two-lane bridge, but that would take at least three months to construct. It would not be able to carry the 3500 cars a day the current bridge did before it closed, but it would be a better fix than riding the Fort Ti ferry 20 miles away or driving hours out of the way. For now, the best option for people in Essex County, N.Y., and Addison County, Vt., is Matot and his ferry. His job is punishing, but certainly not thankless. The Thermoses of coffee and the bags of treats suggest his community efforts have not gone unnoticed. Until the two governments craft a more lasting solution, Matot will keep powering up the Addie B. so that everyone gets across the lake.